Let’s imagine that you, dear reader, are filled with admiration for my cooking projects1 and immediately run to the kitchen to try out each of these recipes over and over. If this is the case, then you have a veritable swimming pool of pesto sitting around, waiting to be used.2 And you’re probably sick of eating it with pasta. Well, here’s some great news! 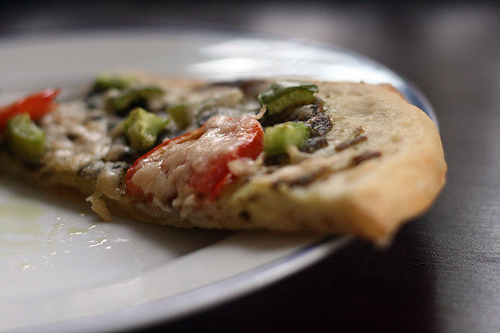 You can have fresh, homemade pesto pizza! Yum yum! And it’s so easy! I’ve made this recipe (modified from Jay’s Signature Pizza Crust) many times, and it is–by far–the most delicious and simplest I’ve encountered. In a large bowl, dissolve yeast and sugar in the warm water. Let sit for 10 minutes. Stir salt and oil into the yeast solution (oil will be in globs). If you’re spicing up your crust with garlic powder, parmesan, or other seasonings, now is the time to add them. Next, mix in 2 1/2 cups of the flour. When you’re ready to bake the crust, form the dough into a tight ball. Allow it to relax for a minute before rolling it out onto a pan or pizza stone. If you use a rolling pin, make sure that both it and the dough are well-floured. This dough is sticky. I usually just flatten it and press it out with my fingers/palms until it’s the right size and thickness. This recipe makes one very large pizza crust or two small ones. Preheat the oven to 425°F (220°C). If you are using a pan or baking sheet (lightly oiled, of course), you’ll need to pre-bake the crust. This is to prevent the toppings from cooking faster than the crust later on. Bake in your preheated oven for 15 minutes. Remove, add your toppings5, then put back in the oven and bake for another 15-20 minutes, until the crust is a lovely golden brown color. (It will be a little lighter on the inside and golden mostly around the edges.) Don’t overbake or you’ll lose this crust’s delicious fluffiness! If you are using a pizza stone, simply add your toppings and bake the pizza for about 20 minutes. And there you have it! 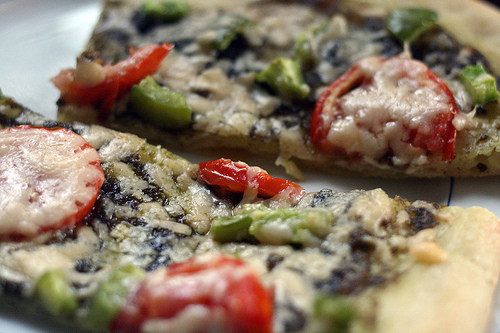 A low-maintenance, highly edible pizza crust. That wasn’t so hard, was it? Want more details? Check out my resume! © 2019 Serena Epstein. All rights reserved.